Very close to the sea and walking promenade leading into Miedzyzdroje. Parking facilities are top-notch. Nice clean place. Free underground parking. Small shop on premises. Two minutes walk ro beach and beach bar. Close to see side and city centre. Underground car park. Wi-fi. Friendly and helpful staff. Located in quiet area. Very happy with the apartment. Staff also very friendly. Would return there for sure! Cats are children-friendly. Very close to the beach (with a beach bar). Apartment was clean and well equipped. Very modern, nice and clean. Near to the sea, like 50 meters. Secured area and car park. Everything needed was in the apartment, including washing machine. Quiet area. Amazing location, excellent flat, very clean, well equipped, felt very safe,had pretty much everything you wanted,even an espresso machine. Very quiet,extremely close to the beach, great views of the forest, nice sized terrace. Lock in a great price for Aquamarina Międzyzdroje – rated 8.4 by recent guests! One of our top picks in Międzyzdroje.Aquamarina is located in Międzyzdroje, just 500 feet from a sandy beach. 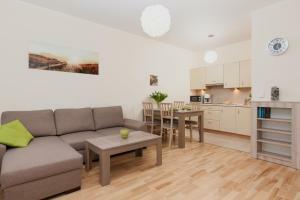 It features spacious modern apartments with free wired internet and a balcony. There is a new, 950 feet long promenade connecting Aquamarina with the town center. Aquamarina is located 0.7 mi from the center of Międzyzdroje. Międzyzdroje Railway Station is just 1 mi away. 뀐 Located in the top-rated area in Międzyzdroje, this property has an excellent location score of 9.1! When would you like to stay at Aquamarina Międzyzdroje? An apartment with a kitchenette and a balcony. 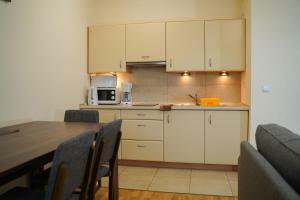 Private parking is available on site (reservation is needed) and costs PLN 30 per day. An apartment with 2 separate bedrooms, a living room and a kitchenette. Apartment with a living room and one bedroom. This family room has a seating area, toaster and electric kettle. Aquamarina apartments are located by the Baltic coast, just a few steps from a sandy beach. Surrounded by a forest, this fenced and monitored property offers modern residential apartments, sized from 37 to 82 metres. Guests will benefit from professional service, a children’s playground and a grill at the premises. House Rules Aquamarina Międzyzdroje takes special requests – add in the next step! Up to two children under 2 years are charged PLN 10 per person per night in a crib. Aquamarina Międzyzdroje accepts these cards and reserves the right to temporarily hold an amount prior to arrival. Unfriendly staff and not accommodating with any requests. The apartments are very small and not fit for 4 people as advertised. The kitchen vessels are old, no paper rolls or basic stuff like salt, sugar etc. There is no oven or microwave. Overall disappointing. Nothing really but broken beach equipment and that's really it. Really close to the beach. not much to dislike. Typical holiday town, great if thats what you like. A lot of construction activity in the area. Good location near a very nice beach. - Cleanliness - Staff - old furniture - The pictures shown are clearly misleading, these are from when the hotel opened. Parts of the furniture was renewed in the last 2 years, but the rest is as old as the hotel. The mattresses in the beds were so soft/worn out, you can feel the springs underneath them. The floor was still dirty, 3 min after walking through it with our socks were black as the night. - the Apartment is GOOD, it had most of what you need to survive a rainy day. But considering that the "main season" just started, the apartment looked already that it requires a refresh in most corners. The wooden floor can be described as destroyed, kitchen furniture is from1970s, bathroom shower also needs a redo. - All in all a good apartment, but it is not high class or standard anymore. For half the price I would consider it a great pick. But for 200-300€ a night, this is not what you expect to egt for your money. Apartment was clean but also need big renovation inside! Sleeper couch for 2 people was terrible. Kids prefered to sleep on the floor. Spacious. Nice bathroom. Wi-Fi good. Garage space close to elevator. The staff was rather unfriendly with limited English and German language skills. Nice location right next to the beach and not too far away from the center. Excellent accommodation for families with small children. Building site was in front of our windows. Sofa was uncomfortable.